Welcome as a member of the Swedish Dachshund Club! The Swedish Dachshund Club was founded in 1901 and Sweden’s first special club for dogs. The club is affiliated to the Swedish Kennel Club. We have 20 local departments and over 5,000 members, we are the fifth largest breed club in Sweden (2016). Our ambition is to continue to develop as a breed club – for Dachshunds into the future – together with you and our great Dachsies! The Swedish Kennel Club is in charge of our membership. NOTE! 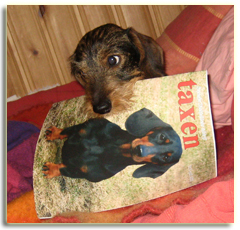 Announce that it applies The Swedish Dachshund Club! The membership fee in the Swedish Dachshund Club is SEK 300 for the regular member and SEK 100 for the family member from 2017. Please contact The Central Breeding Committee, they can provide information and advice on breeding and health as well as references. NB! Sweden has NO puppy farms or dogs in pet shops!!! Bringing a dog to Sweden? Pet dogs have to meet certain conditions to be allowed to enter into Sweden. What the conditions are depends on what country they are imported from. From January 2012 a new set of rules, all set by the European Union, apply for bringing dogs into Sweden. You will find useful and up-to-date information at Jordbruksverket’s website (The Swedish Board of Agriculture). Click on the link: Jordbruksverkets website.